At Interior9, we help you up with Modular Kitchen in Navi Mumbai for the most integral part of your home Kitchen. Help you choose a right Modular Kitchen. To have a good food, a well- equipped cooking environment gets the job half done. What can be better than a furnished kitchen with minimum maintenance? Interior9 designs kitchen which have well organized look and are well equipped. You don’t need to worry about the materials even because we cater budget friendly kitchens and that will easily meet your expectations. We have pre-designed kitchens and we are open to lend you ears and hear your thoughts about your kitchen. 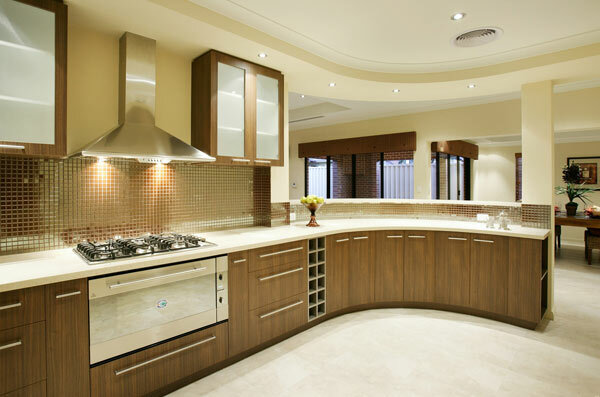 We can customize kitchens as per your choices, designs and space limitations. We have wide range of modular kitchens which include long list of kitchen layouts and material – Whether you need modular kitchen in panvel made from Ply, Solid Wood, Ply with laminates, Ply with Veneer, Glass, Acrylic, Stainless Steel or Aluminium we can provide all of them. And if you are particular about your kitchen layout then at Interior9 you are free to pick the layout of your choice. We provide all types of modular kitchen layouts which include- One wall or straight modular kitchen (best fit for small houses and apartments), L-Shaped Modular Kitchen (fit for both big and small kitchens), U-Shaped Modular Kitchen (Fits perfectly in big kitchens), Parallel or Gallery Modular Kitchens (made for lengthy spaced kitchens), Peninsula or G-Shaped Modular Kitchen (When you need some extra space in your kitchen) and lastly you can pick is Island Modular Kitchen or Open Kitchen Space (they need huge space). Our locations are very convenient, they include Panvel, Kahrghar or Ulwe, and you just need to search online by typing “modular kitchen in kharghar” or “modular kitchen in panvel” or “modular kitchen in Ulwe” or “modular kitchen Navi Mumbai” according to your location. If you are going to install modular kitchen for the first time in your house, then you must read below mentioned points. Work triangle of your kitchen is important, by work triangle I mean how your three important items – refrigerator, sink and the hob are interacting and located in your kitchen. Well understanding them is not a big deal, as all you need to do is draw a rough sketch. The counter top height needs , to be decided smartly, make sure that the distance between the cabinets of your kitchen and counter top should not be too wide as this will make things difficult for you only and handling the stuff kept in the upper shelf will become hard for you. Decide the color wisely, because lighter shades will increase your cleaning task and the darker ones will invite heat. Trust only an expert for this. Ventilation is main source of natural air and light in the kitchen. Lot of heat is generated while cooking and only ventilation can save you. No matter if you have installed exhaust fan or chimneys you still need ventilation. Safety is a crucial part of kitchen and you need to ensure that your kitchen is a safe place to work. From proper gas piping to choosing a floor that is slip resistant, you need to ensure everything. Switch board should be away from the basin and stove. Corners are usually the most ignorant sections in the kitchen but in the modular kitchen concept, you can use every corner of your kitchen. You need to handle your garbage well. If you want to keep your garbage out of the kitchen then you can install a steel dustbin outside or if you want to hide this from everyone’s eye then you can install built-in bins behind the cabinet doors. You can do anything, but for doing few things you need to call experts, so never hesitate to call interior9 expert team. At interior9 we believe that home is a place where you share your bonds so we provide all types of services in improvising the look and feel of your home. Our major services include false ceiling installation, modular kitchen installation; house painting, Interior Work for offices, Homes. You can browse our website www.interior9.in to know more about our services or call at our customer care number. We have catered to hundreds of clients till date. We have handled projects from all over Mumbai till date, you can read testimonials from our clients.